Lately Huawei has been in news regarding the launch of its new smartphone called Huawei Honor 4X. This model offers almost all the most common and latest features that one could wish for in a smartphone at quite a reasonable range of just Rs 9,999 in India. The phone runs on 1.2 GHz quad-core processor accompanied by 2 GB of RAM that makes the phone excitingly fast. Let’s have a look at some of its features that makes it a smartphone to watch out for. 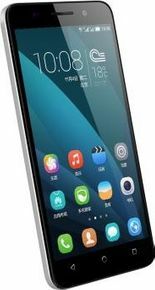 Huawei Honor 4X features a huge 5.5 inch display screen with high resolution display of 720 X 1280 pixels. Its aesthetics are quite similar to the Yu Yureka smartphone but with a few up gradations of course. The glossy dark black body cover gives it an elegant look. It also comes with two slots for microSD sim cards. However, if someone had to pinpoint a drawback in is design it would certainly be non-replaceable battery. The Huawei Honor 4X smartphone runs with quad-core, 1.2 GHz processor accompanied by 2 GB of RAM that makes it excitingly fast. Although it has an inbuilt memory of 8 Gigabytes but it can further be extended to 32 GB with additional microSD storage card. Other common features like 3G, Wi-Fi, GPS and Bluetooth that are available in all the other smartphones are also readily available in Huawei Honor 4X smartphone. The camera in Huawei Honor 4X is its USP. Huawei honor 4X is one amongst a very few other smartphones that offers you the luxury of 5 and 13 megapixels front and rear camera quality respectively at such low price. Other smartphones that offer up to 13 MP camera quality are generally quite expensive. It also allows you to record 1080p HD videos from your smartphone. Huawei Honor 4X has an amazing battery life of 3000 mAh that means 9 hours straight of inhibited talk time and a standby time of around 18 days. For any moderate user the phone will easily last for a day’s work and that is pretty amazing when compared to some of the other battery draining smartphones. If we look at all the features offered by Huawei Honor 4X closely, the smartphone seems to be performing pretty good on most of the fronts. On paper it certainly looks top notch and by some of the early review it seems that it is going to be among the top sellers for at least a few more months.